Are you ready for a change? We offer a variety of Raleigh Landscape services, from new installations and complete renovations, down to simple additions. Whether you want to add a few trees and shrubs to compliment to your existing landscape, or a complete makeover with outdoor living areas, our team of professionals at Outdoor Pros can transform your outdoor dreams into reality. We start by listening to your ideas and goals. Next, we tailor a plan to meet your taste and budget while adding beauty and value to your home. Once ground is broken, we follow a critical path, professionally manage your project, and deliver the best finished product. The end result is WOW! We have a reputation for being the best Wake Forest Landscape company. 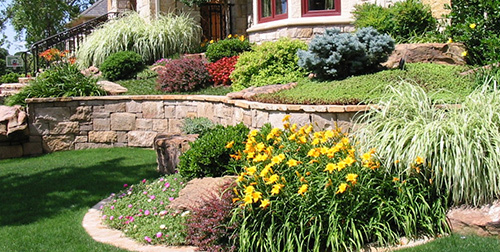 We offer Cary NC Landscaping services, Durham Landscape installation and Chapel Hill Landscaping options. Outdoor Pros has been providing excellent turf care service for us for the past 4 years and we couldn't be happier with the level of service. We receive so many compliments from our friends and visitors about the condition and beauty of our lawn. We also use Outdoor Pros for all of our landscaping services and are always pleased with their work. V. Parker, Raleigh N.C.